Cooling with Heat: Beneficial Properties of Spicy Food | Grand Central Magazine | Your Campus. Your Story. After what feels like years of struggling to amass enough hot chocolate, tea, coffee or soup to keep warm through the bitter winter months, you might be looking for a break from warm comforting foods. While snuggling up with something warm is a good way to survive the winter, and reduce your gas bill, with spring coming, it gets old. But what about another kind of hot – say, spicy hot? There are several benefits to adding spice to your dishes. When considering global cuisine, it’s interesting to ponder why places with the hottest climates enjoy some of the spiciest foods. How could this be beneficial to people that are already breaking a sweat on the daily? Joseph Erdos, of the Huffington Post comments that people in warm regions eat spicy food to cool themselves down. He supports the claim with the idea that the meaning of sweat is to cool down, and by eating food that breaks a sweat, the cooling effect lasts longer than the conventional cold beverage. In an article published in National Geographic, neurobiologist Paul Sherman expands on the topic, claiming that eating spicy foods is a defense against harmful bacteria. His work suggests that people in warmer areas deal with higher levels of microbes in the environment by defensively using the antimicrobial prosperity of spices in their foods. 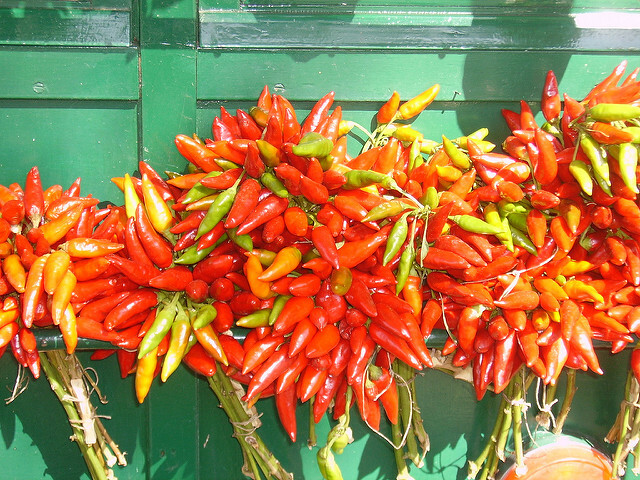 Ellen Breslau of the Huffington Post also adds that spicier foods can aid weight loss by boosting metabolism. The higher your metabolism, the more calories you burn. She also reminds us of the pain relieving properties of spices, such as concentrated capsaicin. The capsaicin works to stunt pain receptors, and in concentrated forms has been used as a topical ointment for pain relief. Whether its your food or your skin, adding heat in the form of spice can serve as relief from the adverse conditions of daily life. Separator image Posted in Drinks, Drinks, Food, Food & Beverage and tagged with beverage, cure, Food, Food and Beverage, Hot, Hot Food, Megan O'Neil, Metabolism, Spicy, Spicy Food.